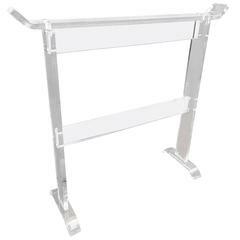 Vintage Hollywood Regency Lucite tray table or luggage rack, signed Scheibe. Collapsed the stand measures H 24.5 by W 22.5 by D 3.75 inches. Hollywood Regency Lucite towel rack by Scheibe $95 flat rate front door delivery includes Washington DC metro, Baltimore and Philadelphia. 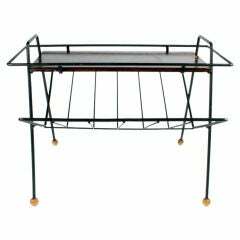 Pair of vintage Mid-Century Modern brass and Lucite stands or tray racks. Mid-Century lucite rack for towels etc. Perfect for your Hollywood Regency decor, this magazine holder is solid brass and in very good vintage condition with minor wear consistent with age. Stands 23" tall. Brass magazine rack in Hollywood Regency style. 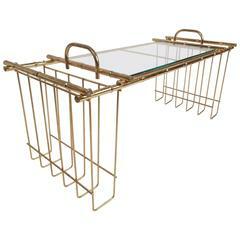 Elegance and transparency for this superb gilt metal magazine rack. All in excellent condition! Glass And Brass Magazine Rack in Hollywood Regency style. Elegance and transparency for this superb gilt metal magazine rack and glass wall. All in excellent condition! The vintage folding luggage racks are composed of stained wood framing and stretchers and canvas strips. They fold for easy storage. Folded - D 5", W 22, H 24.50".